It’s Friday, so, it time to present my photo of Emili in the same location as the one that I showed earlier this week of Jordon. As I said in Tuesday’s post, Emili has light completion and eyes so rather than photographing her with rich colors I wanted the colors in the photo to be light and airy. I changed my f-stop from f/5.6 to f/4 and the shutter speed from 1/90th of second to 1/30th of a second—thus increasing both the ambient light and the effect of the strobe on Emili’s face. I think that the changed produced an image that was more high-key and more in-tune with Emili. The ambient light was darker when I took the photo of Emili so I I think that the overall effect of my camera changes on the ambient light was about one f-stop—not the three that you would expect from the changes that I made to both the f-stop and the shutter speed. 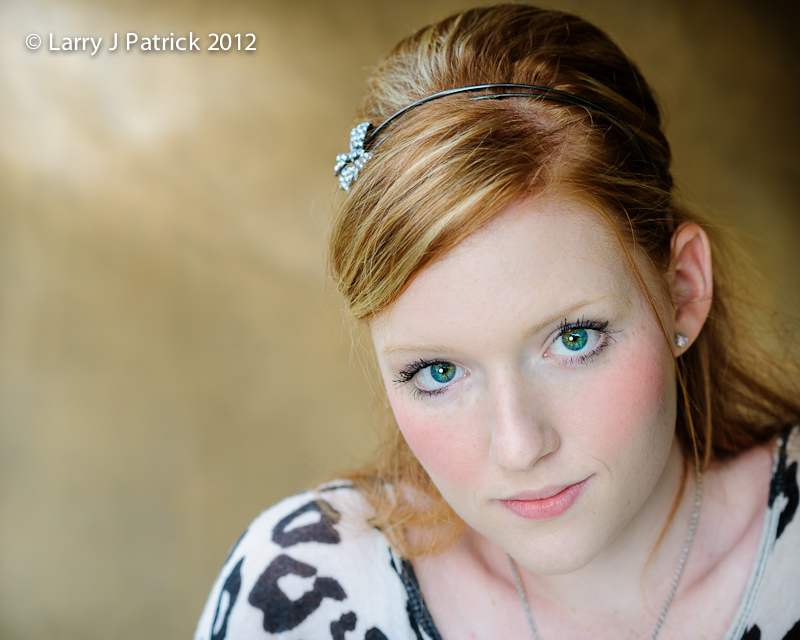 The power changes on the strobe unit was the same so the change in f-stop had the effect of one f-stop on Emili's face. When I shot the photo, I debated upon putting an additional light to Emili’s left to open-up the background but then after seeing the photo on my computer monitor, I was glad that I did not do it. I think the additional light would have flattened the image. The darker side helps add depth to the photo. Camera settings: Nikon D3, Nikon 85mm f/1.4 at ISO 200, f/4 and with shutter speeds 1/30th of second with an Elinchrom Ranger Quadra flash with a 17” beauty dish attached to Emili’s right and about eye level. Lightroom 4—set white and black points, added clarity and vibrance, used adjustment brush to add details to eyes and hair and soften skin and added vignette. I see your point about the two photographs but I do not understand how all your changes affect the different aspects of the pix. Could you explain them sometime? See and like the differences. You did good. I like both photographs. I wonder if you could show us how each would look if you reversed them. I cannot image that they would look that much different. You did good. Both portraits seem to show off the women's best features. I would like to echo Sidney's request about your thoughts on LR4 and Roland's question about seeing the two in reverse. Keep the photos and info flowing. These portraits have a finished look about them that I cannot seem to get by using only LR. Could you provide more details of what you do to make them look like this? I do "enjoy" your work and your comments.